Blackpool is unique amongst seaside resorts in Britain. It wasn’t the earliest resort or even the first resort for working class holidaymakers but it nonetheless grew to dwarf every other seaside resort in the country in size and the range of entertainments on offer. It’s the only seaside resort in the country with three piers and with its vast Winter Gardens and the iconic Blackpool Tower in many ways it came to define working class entertainment and seaside holidays for generations. A key part of the entertainment offer for Blackpool’s visitors were, and still are, the three piers. The first pier at Blackpool was North Pier, opened on May 21 1863, and designed as an attraction for upper-class visitors. The railway had arrived at Blackpool in 1846, and the location for the new pier was specifically chosen to be as close to Blackpool North Station as possible. A pavilion was added in 1874, lavishly decorated with Indian influences where symphonies and recitals were performed in line with its upper-class ambitions. The success of North Pier encouraged developers to expand Blackpool, opening up the seafront towards what is now the town centre. While the town’s first railway station (North) catered for express trains from all over the country, the town centre was not connected by rail until 1863 with the arrival of the Blackpool & Lytham Railway’s terminus at Hounds Hill. The railway opened in stages, firstly to Lytham St Annes, but even this short railhead was sufficient to encourage the formation of the Blackpool South Jetty Company, which announced its intention to build a second pier opposite the new rail station terminus in 1864. When it was completed and opened on May 30 1868, it was built specifically with the anticipated influx of working class customers in mind. In 1878 the Hounds Hill terminus was re-named Central station in line with its adjoining pier and to emphasise its growing importance as a central location. By 1901, the station had expanded to 14 platforms and was as large as London Paddington is today. At the height of the seaside boom in 1911, it was officially the busiest railway station in the world. With the growing influx of visitors, and the growth of hotel accommodation, the Central and Northern areas of the town effectively overlapped and the classes began to mix. In order to preserve something of an exclusive area for the higher class clientele, the entrepreneurs turned to the undeveloped southern beaches towards Lytham, and in 1892 began construction of Victoria Pier, given its royal name to distinguish it from the other piers. Opened on Good Friday 1893, it boasted a 3000 capacity. Since their construction between 1863 and 1893, Blackpool’s three piers have all morphed and changed constantly to suit the needs of an ever changing tourist market. Fires, storms (and the odd ship or two) have had their impact, but the greatest force has been the pressure for new and more exciting entertainment and amusements. That is, until now.y Grand Pavilion which opened in May of the same year. 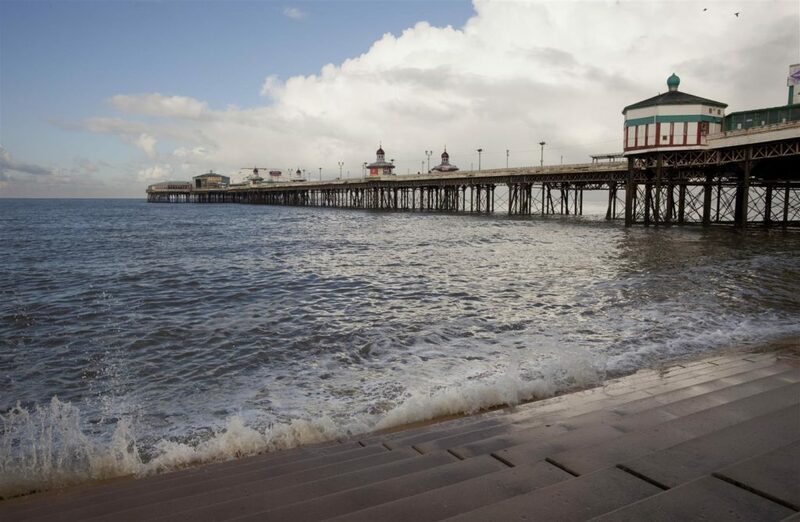 Over the last five years, nine of the UK’s seaside piers have suffered significant damage from the impact of storm surges, including Cromer, Saltburn, Teignmouth, and Aberystwyth. 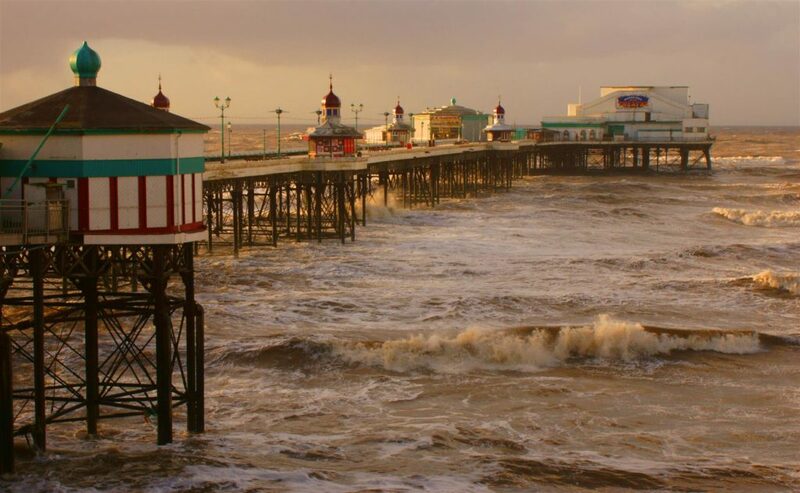 In the winters of 2013 and 2014 Blackpool North pier was significantly damaged in repeated storm surges, resulting in urgent repair work costing well over a million pounds. The Shoreline Management Plan which covers the area around Blackpool’s three piers indicates a significant risk of flooding alongside beach and sea defence erosion over the next 100 years. Nationally, the 57 seaside piers within England and Wales are all located within coastal areas with Shoreline Management Plans that recommend ‘Holding the Line’ in the long term (2055-2105), yet the line being held is the shoreline, not structures such as piers that are beyond the shoreline, leaving them exposed. 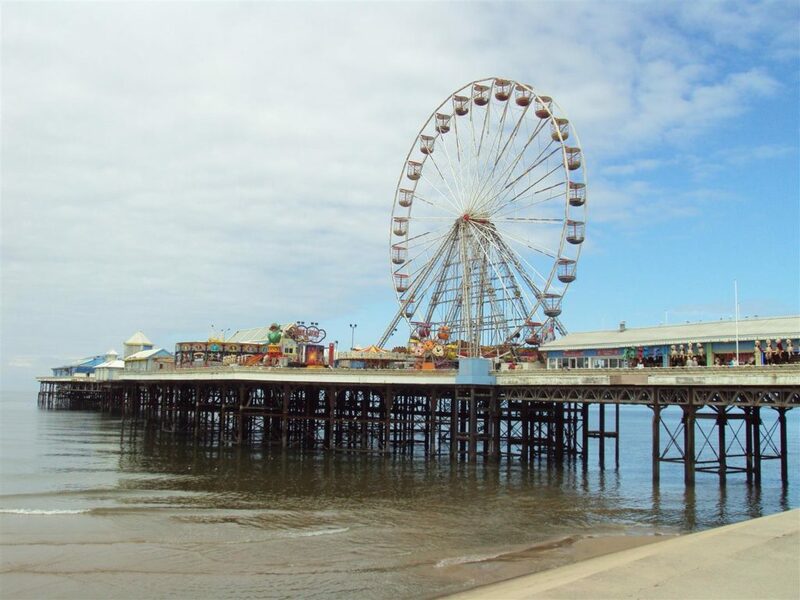 Nevertheless, piers must be considered ‘key infrastructure’ for the resorts that they serve – acting as flagship tourist attractions and community hubs – and Blackpool’s three piers are as important a part of this tourist offer as they have always been. Recent research published by AOL (2016) has shown that a walk along a pier is the most popular activity for visitors to the British seaside, with over 70% of respondents visiting a pier. Domestic tourism to British seaside resorts is gaining market share and is now estimated to be worth circa £8 billion to the UK economy and accounts for 31% of all domestic overnight holiday trips and 8% of all tourism day visits (NCTA, 2016). 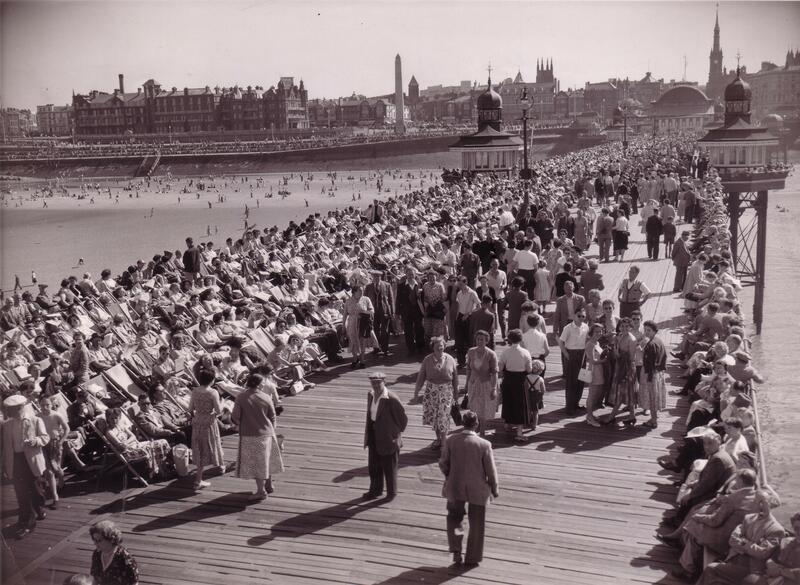 Furthermore, British seaside resorts are considered to be key potential growth destinations for international tourism, and their Victorian seaside piers are unique attractions in the product offered to the international market. With over 17 million visitors to Blackpool per annum, the resort’s three piers are a flagship tourist attraction and a key component of Blackpool’s identity as a seaside resort and a fundamental part of the story of the seaside holiday. This is why Blackpool welcomes the inclusion of piers on the World Monuments Watch. Climate change is the thing that we, as a seaside town cannot change, but the dialogue we are now having with the owners, with central government and with organisations like the National Piers Society are making a difference with how we look at coping with that change and preparing for the future.